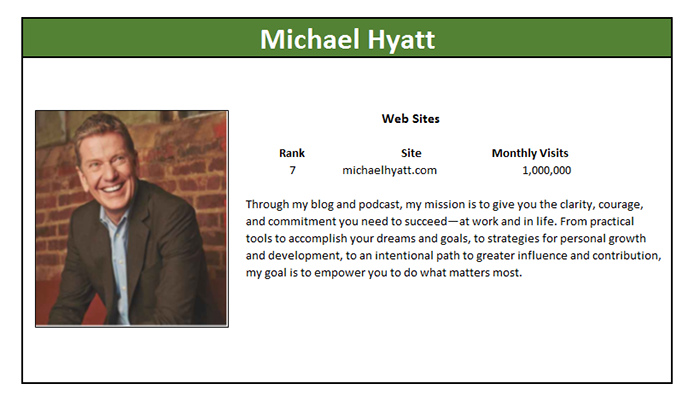 Marketing Master Profile for Michael Hyatt. What’s This? I first learned about Michael Hyatt when Amy Porterfield mentioned him. He’s had quite a career and moved from being the Chairman and CEO of a large book publisher to his second career as an entrepreneur. Towards that end, he styles himself as a virtual mentor for his audience. He’s ranked #7 of the Top 15 and gets about 1 million visits a month. Michael Hyatt’s traffic sources lean heavily towards Direct, Referral, and social Media, whereas most of his peers are heavier on SEO. He doesn’t do badly there, but his rating is 30.49% versus the Top 15 average of 43.7%. His Referral rate is 3x the average while his Social Media rate is 5x the average, so he is totally crushing those channels. Hyatt’s content quality scores are pretty much inline with the averages, though his bounce rate seems a tad high. That bounce rate may simply be a function of getting so much Social Media traffic which is known to have a higher bounce rate than most other channels. People coming from Social Media often read the page and then go straight back into the Social Media they came from. Michael Hyatt’s SEO scores are very much inline with the norms. It’s interesting to review the Social Media mix given just how much traffic Hyatt gets from this channel–5x the Top 15 average. Other than a much higher Twitter rating though, his mix is pretty inline with the averages. This simply tells us he isn’t winning by which channels he’s chosen but by how well he is using the various channels. Congratulations Michael Hyatt, you’re a definite credit to the Top 15 Marketing Masters of the Digital World!